Learning Architectural Solutions by Eluding Restrictions(LASER)…..
ME: Of all machines capable of bolstering the digital fabrication process, why did you choose the Laser cutter? NATALIE: I chose the laser cutter because I wanted to build a machine that would be helpful in rapid prototyping of designs on a small scale. ME: For the fact that you are not an electrical engineering major, how did you put the machine together? 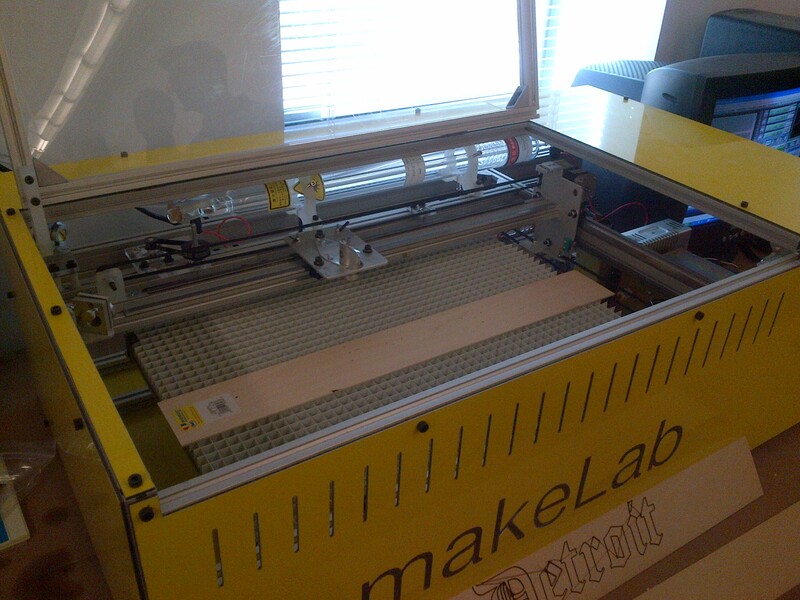 NATALIE: I found open source plans for building a laser cutter online at Buildlog. The site provided a listing of all the parts needed as well as documentation on how to assemble major components. There was also an extensive forum which helped me to troubleshoot some problems I had along the way. ME: Plunging deeper into the problems you had to troubleshoot, what were some of the construction problems you encountered? NATALIE: One of the biggest problems I faced while assembling the machine was that I sloppily soldered the stepper motor drivers onto the board and when I tested them, one caught fire and the other two over heated. Another difficult task was the wiring of the electronics. There is a safety loop integrated within the board. This safety loop controls the amount of power reaching the laser at any given time. Power to the laser will shut off if the cover is opened while the laser is firing, the emergency button is pressed, or if the laser cooling system is not working. The wiring of this connection was difficult but after troubleshooting all the components, I was able to fix the problem and command the laser from Mach3. ME: Hmm…. Mach3?! What exactly is the Mach3? Is it some kind of software that bridges the computer design to the laser cutter? NATALIE: Well… The laser cutter runs off of Mach3. For vector cutting, any 2D lines can be brought into a program called Cut2D. The program processes the file and adds to the code so the laser can be triggered on and off during a cut. For raster engraving, Mach3 has a plugin that accepts both bitmap files and jpegs. ME: if you were to construct another Laser cutter, are there any opportunities you will consider exploiting? NATALIE: If I were to build a laser again, the first thing I will consider is making the bed larger. 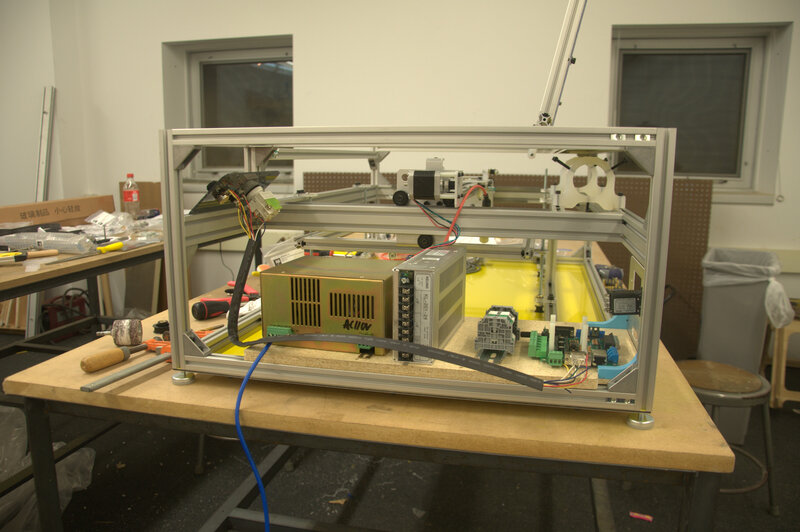 The current bed is 12″ x 20″ and it is a 40W laser. I would also make some modifications to the skin of the machine so that it could better adapt to use. For example, better access to scraps that have fallen through the aluminum grate. ME: Compared to the CNC machine which the makeLab already possesses, is there any major difference? NATALIE: The laser is a tool that allows designs to be created into prototypes at a smaller scale than the CNC. It also brings new capabilities and allows for engraving, or precision cutting on a small scale.